PROlat is a single-position solution for placing pedicle screws and other spinal hardware in the lateral decubitus position. ORLANDO, Fla. | June 13, 2016 | Mazor Robotics, a developer of innovative surgical guidance systems and complementary products, today announced that Dr. Ronald Lehman was the first in New York City to perform a PROlat™ procedure using the Mazor Robotics Renaissance® Guidance System. Dr. Lehman used the technology to assist in a lateral procedure and found significant savings in both operating room time and use of fluoroscopy. 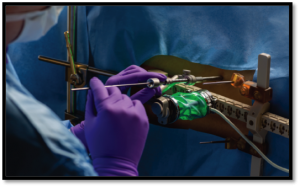 The PROlat solution by Mazor Robotics allows for improved efficiency of lateral lumbar interbody fusion (LLIF) with the planning and guidance of Renaissance. For non-staged LLIFs, pedicle screws may be placed in a lateral decubitus position following interbody fusion. By eliminating the need to flip the patient into prone position, this can save time in the OR and streamline the procedure. Dr. Lehman also documented that only seven (7) seconds of fluoroscopy was used during the procedure—a significant reduction compared to what would have been used with standard fluoroscopy or navigation (which requires an intraoperative CT scan)—and, in turn, lowered radiation exposure for surgeon and staff. “Dr. Lehman is a Professor of Orthopaedic Surgery with tenure, the Chief of Degenerative, Minimally Invasive and Robotic Spine Surgery, and a leading national and international spine surgeon. His adoption of the Renaissance system continues to validate the clinical value proposition of our technology,” said Ori Hadomi, Mazor Robotics CEO. Mazor Robotics (TASE: MZOR; NASDAQGM: MZOR) believes in healing through innovation by developing and introducing revolutionary robotic-based technology and products aimed at redefining the gold standard of quality care. Mazor Robotics Renaissance® Guidance System enables surgeons to conduct spine and brain procedures in a more accurate and secure manner. For more information, please visit MazorRobotics.com.